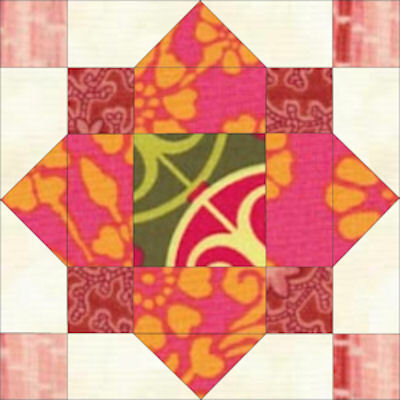 Review of Leah Day’s FREE MOTION QUILTING DVDs….. I treated myself to an early Christmas present and bought the DVD comb from Leah Day on Black Friday. I got the BASICS FOR BEGINNERS and BEGINNER FREE MOTION QUILTING FILLER DESIGNS. I have been following her on line on her blog and YOU TUBE video posts. I enjoy her presentation and the information she presents. Leah goes into depth with her instructions of FMQ, bringing up some considerations I had not thought of before. I enjoyed the ways she discusses her thought process on how she tackles FMQ for a big quilt or a whole cloth. i loved her discussion on strategy, I have not seen or heard the same from some of the other FMQ DVDs I have looked at. Leah shows how to load a larger size quilt, I loved her squoosed phraseology. I have been following along with her instructions with the idea of improving my FMQ. I am making a series of fancy “pot holders” while I practice my lessons. I am practicing what SHE preaches… so wish me luck. I loved Leah’s presentation of FREE MOTION QUILTING my only complaint was the sound quality. I watched the DVDs with my neighbor who wears hearing aides and she had trouble hearing the DVD because of the sound quality. I think Leah records with her husband in her basement studio so they pick up sound distortion. . We picked up some “echo” during PARTS of the recording. It was not terrible and was tolerable for me. During the times she was actually showing the quilting, her sound and voice was understandable and easy to hear for both of us. We mastered the “echo” problem by using a MY ZONE HEAD SET for my friend, she could adjust the sound and hear better but we could not watch the DVD together so she borrows it . I am enjoying the DVDs which are very like her YOU tube videos. I would recommend the series to beginner FM quilters. I think Leah’s DVDs has a lot to offer. I was impressed that this was a HOME PRODUCTION that was made by Leah and her husband. I do know how to cook,but I do not like to. The only reason to cook is to feed my family. I find basic American food to be too high in fat, salt, sugars and basically things that are bad for you. I also think a lot of it is pretty flat and tasteless. ( I love ethnic foods best.) This book is pretty much European in flavor and technique, but I do have to watch the salt and fat content of the recipes. I do consider it a GO TO BOOK for basic cooking, if I am stumped for what to bring to a gathering or party this and the sister book NEW CLASSICS are the books I read. I think they will save Thanksgiving this year. I reference it a lot. I consider it a great book to give to a new bride. Yes I am using it for my THANKSGIVING TURKEY. This book and the ORIGINAL CLASSICS book are my GO TO COOKBOOK for basic American cooking. I often have to bring dishes to work potlucks and I usually pick a dish from these books and they are usually received well. I like this book a little better because the flavors are more ethnic and adventuresome. Many of the recipes are from Asian, Hispanic, African, Indian cultures along with other experimental American cuisine. The flavors are more experimental and exciting. Great gift to a new bride or a novice cook who wants to expand their pallet. HEAT skillet with 2- 3 tbsp oil…… add chopped onions , raisins, 2 tablespoons curry powder, 1/2 tsp salt … saute till onions are tender… 5 to 7 minutes.Stir in chopped garlic ( four cloves) and 4 tsp fresh grated ginger root stir for a minute. Add turkey …. When heated through take off the heat add plain yogurt and cilantro or chopped parsley. I do not have an exact calorie count for this recipe but turkey is about 40 cal per ounce, it is the other stuff we do to our food that adds calories. BAKE A REFRIGERATOR BISCUITS …. According to instructions … or use leftover from Thanksgiving dinner. Making sauce, in a skillet …. Heat 2 TBSP BUTTER ( unsalted) chopped onion, sliced celery, 1/4 tsp plus dried thyme, salt 1/2 tsp…. Add 1/4 cup flour in small amounts until incorporated. ( This gets rid of the raw flour / pasty taste of uncooked flour) (optional add 1/4 cup vermouth or dry white wine or broth) Slowly whisk in 2-1/2 cup broth and 1/2 cup of heavy cream ( I use milk ) Bring to a boil then reduce to a simmer. Add leftover roasted vegetables, I also add any left over other vegetables… broccoli, cauliflower, or casserole (rice) When heated trough add cooked turkey ( 2 cups /plus) and left over frozen pea pods or peas. I have been known to throw cheese on top …. Then Top with biscuits. I put my skillet in the oven at 350 just long enough to set the table. Serve immediately. I may have to cook an extra turkey in order to have enough turkey to make all the leftovers. I also frequently freeze some of the sliced turkey to thaw at a latter date… Hubby will only eat so much turkey so many days in a row. THANKSGIVING RECIPES: Family favorite left overs…. In a baking dish, layer turkey, artichokes. In a pan over medium heat, saute garlic. Reduce heat. Add flour and seasoning, stir continuously till smooth and bubbly. Remove from heat add wine and milk. Bring back to slow simmer stirring. Remove from heat add cheese and brandy, stir till melted. POUR OVER TURKEY AND ARTICHOKES. Sprinkle with paprika. Chunked cuts of vegetables: onion, celery, green and red pepper, mushrooms,zucchini… what ever you like! cherry tomatoes or grapes for the top of the kabobs. Fry bacon till cooked and limped not crisp. DRAIN WELL. For each kabob skewer potatoes, vegetables of your choice, chunks of turkey. Wrap a piece of bacon around the turkey by skewering the bacon adding the cube of turkey then adding the bacon. Brush with Ginger Wine Sauce … but I find it easier to marinate the ingredients in a plastic bag for a while before assembling the kabobs. Broil on high ( 550 degrees) or grill x 5-10 minutes, brush with more sauce. Cook all ingredients in a sauce pan, till it thickens, stir continuously. Calories: 270 per kabob. These ladies are in my quilting group and I have known and worked. We have met at Elaine’s Quilty Shop each Wednesday since 2005. Times have changed, our life has changed, we are disbanding the weekly meetings; but never fear we will now be meeting once a month for open sewing meeting the FIRST WEDNESDAY of the month at the town hall. 4:30 pm til 8:30 pm. (The building where our quilt shows have been hosted.) The sewing sessions will be open to anyone who wants to quilt or learn how to quilt. We have few rules or requirements, except you must bring a project to work on. 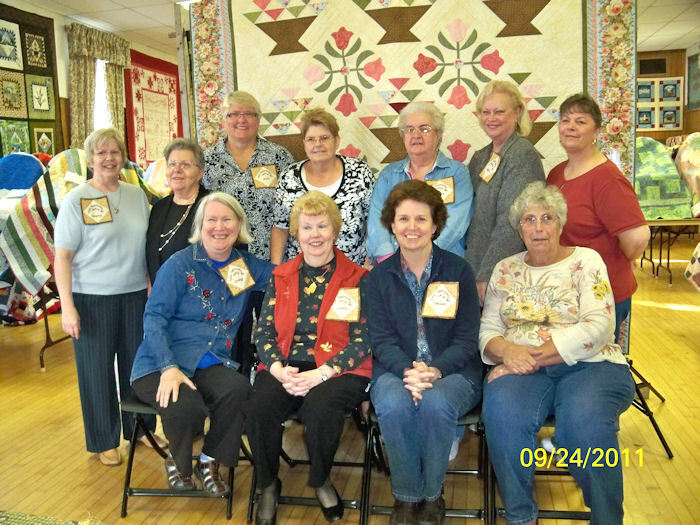 The quilt behind the ladies is a raffle quilt they made for HABITAT OF LAPEER, MI; it will be raffled this December. OKAY, it is not turkey but I like it with chicken better. BTW I cook by the seat of my pants, and improvise all the time. Recipes posted from the original source but I make notations about how I changed and improvise them. 6 chicken breast, flatten between plastic wrap or wax paper. Make a herb butter by softening half cup butter ( I usually make double and use in other recipes) Chop chives and / or chopped green onion tops (tbsp each) to taste, garlic POWDER 1/4 TSP to taste. Shape into a log about 1 to 2 inches round. freeze, then cut into small slices about 1/4 inch thick. Take the flatten chicken breast and put a slice of the herb butter in the center. Roll/ fold and secure with tooth pick or long skewer. Dip the chicken roll in the butter milk then in the cereal mixture. Place rolls in a baking dish seamed side down. Cook uncovered at 425 degrees x 30-35 minutes. I have substituted the corn flakes for other plain cereals when I did not have cornflakes. I have also used bread crumbs… my favorite was rye bread crumbs. For the dip I have substituted plain yogurt and or sour cream ( half and half) It usually depends upon what I have in my kitchen that day. I also increased the amount of seasonings, because I am Italian and love the flavors of garlic, chives and or green onions. I made the this block exactly like the book, ( Modern Blocks: from your Favorite Designer) but I have been playing with it and have made some modifications to the block. I will be posting a picture of my favorite block and quilt modification. This is my go to book when I have a problem quilt. Defining the Norm… figuring out what went wrong. The one problem with the book as it is old and the quilts are somewhat dated. 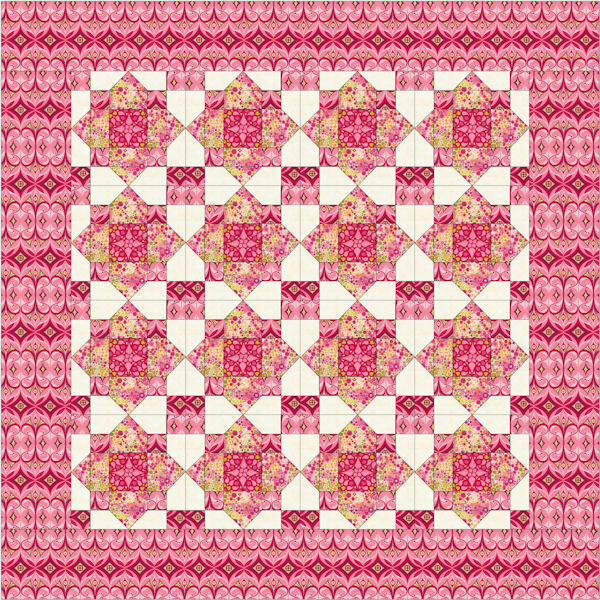 I have seen quilts using these techniques and they are lovely, but right now I am looking for a new and different setting. There are a lot of great technique in this book that will make quilts special. All of Sharyn’s books are good for problem solving and great looking quilts. This was one of the first quilt books I got. I got as a guild sales book, but I would buy it again. I frequently use the patterns for baby quilts. I particularly like the house quilt in which I embroider the names of family on the houses when I make a baby quilt with it. This book uses your scraps to make quilts, frequently using some quick cut techniques. I love the STARS AND CROSSES quilt which was featured on Fons and Porter TV show as a quilt made by young Mary Fons. I loved and have used the quick sew technique of making BRAVE WORLD blocks. The book also included several applique patterns. 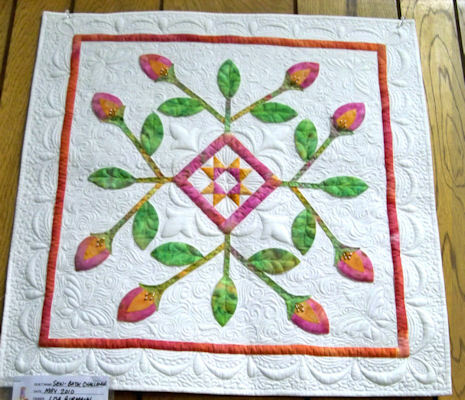 The fabric in this quilt ran the gamete ….. brights, repros, 30s, traditional, home spun. 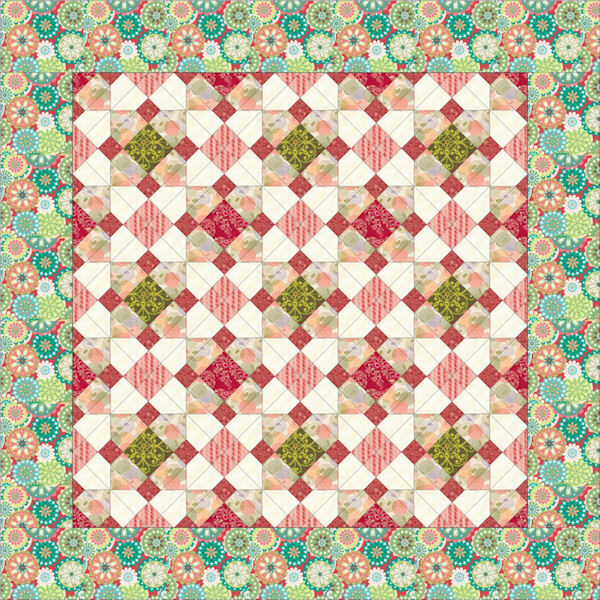 I would like to see some of the quilts in some contemporary fabrics.